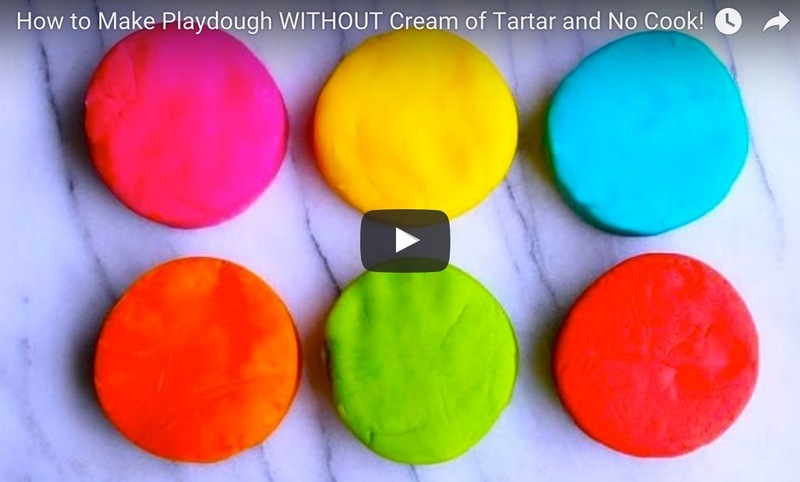 Cream of tartar makes the play dough last longer, but this recipe skips it in case you don’t have any in your kitchen. Divide 1 cup of water between 4 bowls. 1/4 cup in each! Add a different color of food coloring to each bowl, a few drops. Add 1/2 Tablespoon of oil in each bowl (vegetable or canola). Now, put 1 cup of the dry mixture into each of the colors and stir. Knead each on a cutting board until nice and smooth. Store in ziplock bags and keep in the fridge to make play dough last longer. Don’t forget to Kid Test!